The SchoolNet Conference 2017 has been and gone but the memory lingers on… This post brings you a handy list of links including links to presentations from some of our presenters. Only 24 of our presenters have shared their presentations to date, and we are very grateful to them. But first, a quick recap! 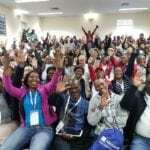 Over 400 delegates attended the 2017 SchoolNet SA ICT in the Classroom conference held at Brescia House School in Bryanston, Gauteng between 5 – 7 October 2017. It was a conference to remember with amazing international keynote speakers and a great assortment of local speakers as well. The conference was opened by Deputy Minister of Basic Education Enver Surty who also sat down with SchoolNet’s executive director, Janet Thomson, to define the national Department of Basic Education’s plans for digital learning. SchoolNetSA also celebrated its 20th Anniversary at a well- attended cocktail function at the SchoolNet Conference – and what a celebration it was! The 2017 Conference website which also hosts the programme and a link to the final resources can be found at: http://www.schoolnet.org.za/conference2017/ . The Conference was a huge success and we thank Brescia House for the incredible facilities they provided.